TROX slot diffusers VSD35-Varyset (1 to 4 slots) are especially suitable for installation in plants with variable volume flows (VVS). TROX slot diffusers of the VSD35-Varyset (1- to 4-slot) type are ideal for deployment in systems with variable volume flows (VAV systems). Despite the large volume flow range from 100% to 25%, the slot diffusers maintain stable discharge behaviour, even in cooling mode. The automatic Varyset damper in the rear-mounted plenum box operates without an external energy supply. The VSD35-Varyset is suitable for installation in rooms of up to 4.00 m in height. It offers high induction, resulting in swift reduction of the supply air temperature differential. 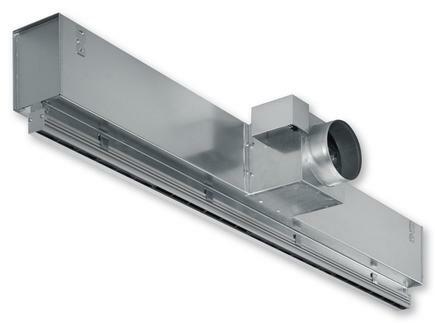 The recommended supply air temperature differential stands at ±10 K.
Slot diffusers of the VSD35-Varyset are supplied with a rear-mounted plenum box. The Varyset damper is adjusted to the desired volume flow range by means of a counterweight. The units are connected to the duct system via the side-mounted round spigot.